Author Nobleman visited GMSD schools to share his writing and research process with students. 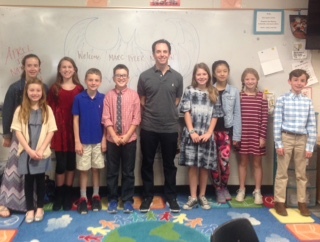 Author Marc Tyler Nobleman was a guest of GMSD during the week of April 2, 2018. Mr. Nobleman visited all three elementary schools and both middle schools to share his writing and research process with our students. Mr. Nobleman has published two nonfiction texts that center on the origins of the Superman and Batman comics. It was his research of these books that his presentation focused on and students along with GMSD faculty were surprised by many of the facts he revealed. Dogwood third grade teacher Lew Carmichael said, “I consider myself a comic book fan and I had no idea,” after the author visit had concluded. This special week was the result of district wide coordination by the GMSD librarians who plan to continue this now annual event.